Before I'd read a word of this book I was excited by the premise. People returning from the dead? Crazy, right? Now, zombies and such aren't my usual bookish milieu, to put it mildly. But this? This was a whole different kind of tale. I thought this was such a beautifully sad story. It broke and warmed my heart in equal measure. There were times I was angry. There were times I wanted to weep. Most importantly, this book made me think. I couldn't help but wonder about what the world would be like if these events actually happened. On a personal level I couldn't stop thinking about who I would want to come back, if only for one more day. I've been chewing on these questions ever since. Jason Mott shows just how marvelously complicated and fragile human beings really are. The Returned isn't a book I'll soon forget. For more thoughts (and a different opinion) on The Returned please see this review from Monika at A Lovely Bookshelf on the Wall. Luckily my sister got the Dutch version of this book, so she could review it on her blog, so I think I might read it too. Sounds like a great story! I ended up a little lukewarm on this one, but I totally agree that the premise is fascinating and I think it would be an awesome bookclub book because there is plenty to talk about! Aghh this is my next read, and I can't wait! Your review has made me all the more eager; I want to feel all those feels! I can't wait to read it! I already have it. I like that it made you think but I'm not sure about people coming back from the dead. 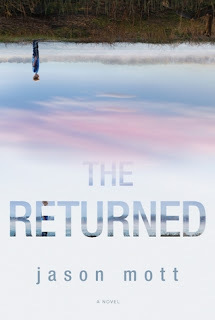 People I know have been going crazy for the TV show The Returned recently and I was sure it was an adaptation of this book, the premise sounds so very similar, but I just discovered the two are unrelated and ABC have their own televisation of this book coming out soon! I wonder how it will compare. I quite fancy reading this, though, it sounds like such an interesting if spooky premise. All of the shows/books/trailers for this book and similar shows have me all confused, lol. The premise is incredible isn't it?? It's been all over the place lately hasn't it?? Yeah! And on people's currently reading shelves. I wish I grabbed it on Netgalley, but hey I am on a self-imposed ban! I definitely want to read this one. Maybe for the next #diversiverse! Ah yes, it'd be perfect for something like that! Ooooh creepy! Sounds like a good one! It was crazy and good and definitely creepy! I really want to read this one! I liked The Leftovers by Tom Perrotta about the people who were left behind after some type of rapture event, and this one seems to have a similar vibe. Oh yea, I liked The Leftovers too Laurie. This was like that..but almost opposite ;) People coming back...not disappearing! I feel like the concept of seeing someone you love again has the potential to be so poignant because it is both so specific and so universal. I'm off to request this book from the library! Wow, The Returned sounds like a must read. What an interesting premise. The buzz for this book is certainly swelling ;) I think it's going to make a big splash. A great idea for a story and it sounds like it moved you. I keep seeing some great reviews of it around the book blogosphere. I must try and read it! Yes, definitely a very moving story. It gave me a lot to think about! Just starting this one today. I was hoping it wasn't going to be sad. I'll look forward to hearing what your final thoughts are Leslie. Sad...yes, for me at least. Definitely sounds like an awesome book! I haven't heard of this before so I'm going to look for it. It was a lot different than anything I've read before. And that's a good thing :D I've been stepping out of my box lately and I'm loving it! I really need to read this! I have a copy on the way in the mail for a tour and I'm really looking forward to it. The author went to UNCW (which is where I went for undergrad), so I feel like I should show some support. This sounds wonderful, Jennifer. I like books that make me think and draw out my emotions. I will definitely be adding this one to my wish list.